BEIJING, China (CNN) -- When Hillary Clinton visits Beijing this week, her Chinese hosts will closely watch her body language and parse her every word. Her first trip here as the U.S. secretary of state comes in the shadow of the global financial crisis, the pressing North Korea nuclear issue and a warming planet. 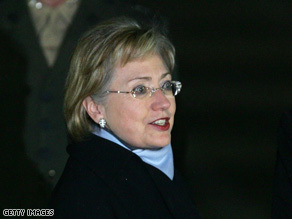 U.S. Secretary of State Hillary Clinton will arrive in Beijing on Friday. The U.S. Congress has passed a massive stimulus bill that will plunge America even deeper into debt. Will China help out? About $700 billion of China's $1.9 trillion of foreign reserves are in U.S. Treasuries. If China sold those assets, U.S. interest rates would spike and would further decimate China's export industries. Such a scenario would be distasteful for both Washington and Beijing, and that's why it's critical that Clinton convince the Chinese to hold this arrangement together. Why should China buy even more? "I think if China sits out a treasury auction, what happens to the American economy? What happens to the American stock markets?" McGregor asked. "China is now in a position of power when it comes to American finances." What do Chinese expect to hear from Clinton? Victor Gao, director of China National Association of International Studies, hopes America's top diplomat can "assure the overseas investors, including China, that their investments in these securities will be protected." He believes China will ask Clinton to keep the U.S. dollar as strong as possible and keep it from depreciating. For its part, Gao said China "will not do anything irresponsible" with the bulk of U.S. Treasury bills it holds "because the interests of the Chinese and American economy are now very much intertwined." McGregor agreed: "China already owns so much American debt that they cannot afford not to have America be successful." The Chinese also hope Clinton will help mute the protectionist voices in the United States. "It's time for the U.S. to demonstrate that it will continue as the champion of free market and free trade," Gao said. "If anyone wants to equate patriotism with protectionism, that's the wrong recipe." "Things are going to be very, very different from now on between the United States and China," said Michael Santoro, author of the book, "China 2020." Much more is at stake. Barack Obama has identified the relationship with China as one of the most important foreign-policy issues of his administration. Washington also needs Beijing to play a positive role in the resolving regional hot spots. The Korean nuclear issue has brought Beijing and Washington together to seek the peaceful denuclearization of the Korean peninsula. Chinese President Hu Jintao is just as eager to strengthen ties. "China still needs America's market, needs to keep the U.S. dollar strong, and also needs the U.S. to open its market to Chinese export," said Yan Xuetong, an America-watcher in Tsinghua University. Since China and the United States formally established diplomatic relations 30 years ago, bilateral relations have grown. Quite often, however, they have been punctuated by disputes over trade, human-rights disagreements and China's policies on Taiwan, Tibet, and religious freedom. Now the aim is to put the relationship on a more predictable, even keel. Despite problems, there is optimism in Beijing. "Our common interests are much bigger than our differences," says a government official who asked to remain anonymous. "We don't see either side making significant shifts in policies." Meanwhile, China analyst James McGregor already notes a shift in tone: "The U.S. used to come here and lecture China," he says. "Now the U.S. is coming here to kiss up to China."